“Lynn wedding services” is the name of a renowned event management team which provides complete range of party rentals, event management, florists and catering services. Irrespective of place, size or type of event, chair is the essential furniture always. 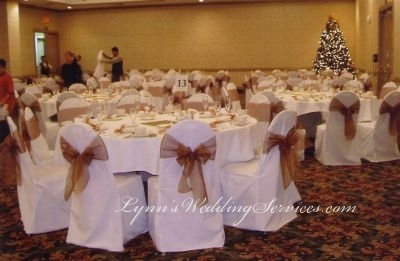 Wedding chair covers can enhance the look for any reception ballrooms or halls. 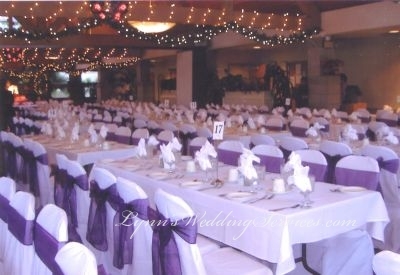 We offer best quality of Wedding Linens rental, Wedding Chair Cover Rentals, Banquet Chair Cover rental, satin chair covers, sash rental, Folding Wedding Chair Cover rental, Self-Tie Chair Cover rental, Overlay rental, and any colored chair covers rentals in San Jose, San Francisco, San Mateo CA. 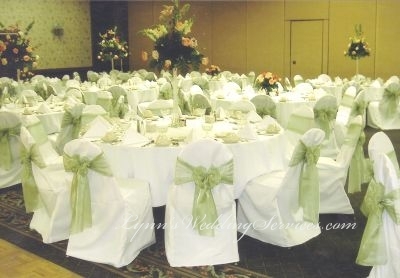 Our Wedding chair covers rental included the organza sashes, set up and take down the same night thus it is the most economic solution for you to cover up those ugly chairs for your wedding or special event without spending too much money. We carry many type wedding chair covers rentals, square back chair cover, larger size banquet chair cover, high back chair cover in San Jose, San Francisco, San Mateo CA. 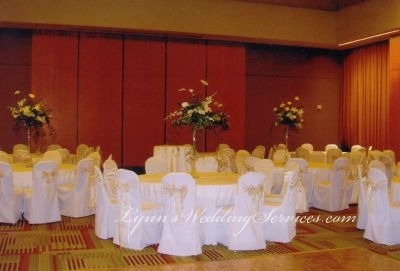 We also provide wholesale wedding chair covers rentals to major hotels and banquet locations. 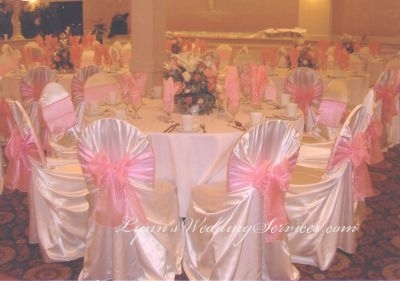 Our goal is to provide quality chair covers, not cheap chair covers but affordable chair covers. We also provide Table Linen rental, Table runner rental, Napkin rental, and Table Skirt rental for weddings, banquets, intimated dinners, birthday parties and formal events in San Jose, San Francisco, San Mateo CA. We offer wide range of Chivari Wedding Chairs Rental also. Our Wedding chivari chairs range includes gold, silver, mahogany and black chivari chairs which can be said as the royal colors for Chivari chairs. 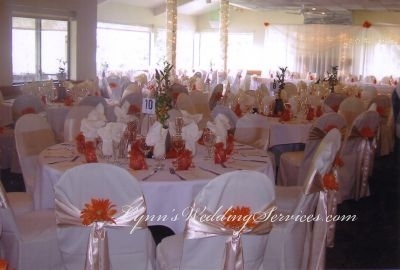 At Lynn Wedding Services, chivari chairs rental offer include delivery, set up and take down in San Jose, San Francisco, San Mateo CA. 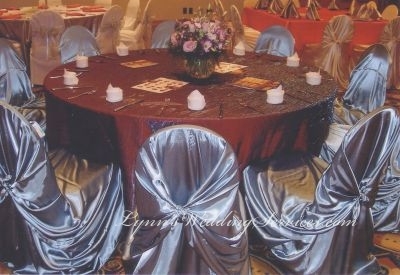 In addition we are always ready to take order for making fancy chivari chair covers for you. Here is an incomparable super saving offer for you at Lynn Wedding Services, all chivari chairs include the cushions, so you would not have to pay extra for cushions. White, ivory and brown cushions for chivari chairs are available at Lynn wedding services in San Jose, San Francisco, San Mateo CA areas. Lynn Wedding Services understand all of your venue decor needs whether it is wedding flowers, chair covers, table linen, and catering services or much more, we can make your event wonderfully excellent. We are the best Event Planners, Florists, and Event Decorators working in San Jose, San Mateo, San Francisco and Fremont ca areas. Contact us to let us help you personalize your events to make them unique, delightful and unforgettable in the real sense! 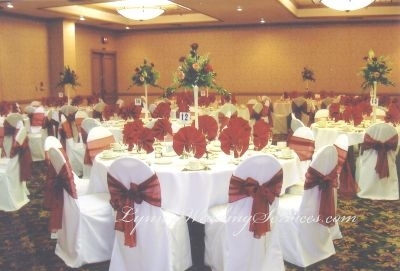 When comes to party rentals, many of our customers wanted to rent chair covers or chivari chairs to enhance any special occations from birthday parties, anniversary to wedding reception venue . 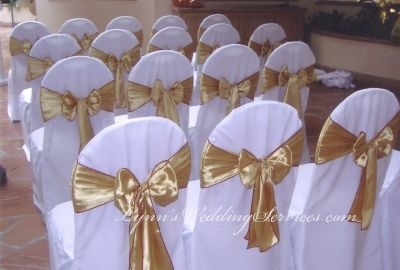 Irrespective of place, size or type of event, many brides like to rent chair covers for the wedding reception sites . Wedding chair covers can enhance the look for any reception ballrooms or halls by just adding a touch of colored sashes or ribbons on them. 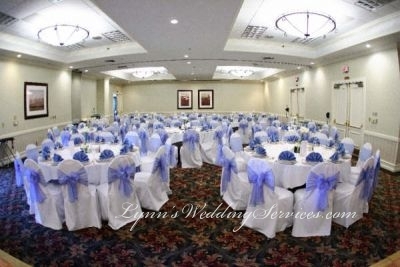 We offer quality chair covers not cheap chair covers rental. 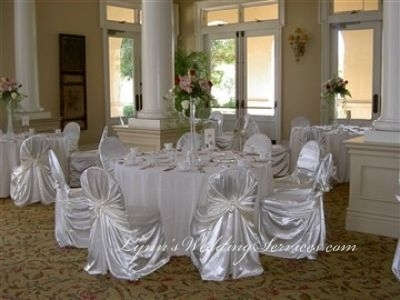 Having variety types of chair covers, our clients can choose to go with Banquet Chair Cover rental, satin chair covers, sash rentals only, Folding Wedding Chair Cover rental, Self-Tie Chair Cover rental, Overlay rentals, and any colored chair covers rentals in San Jose, San Francisco, San Mateo CA. 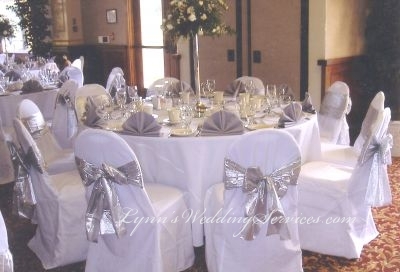 Our Wedding chair covers rental included the organza sashes or satin sashes, set up and take down the same night. 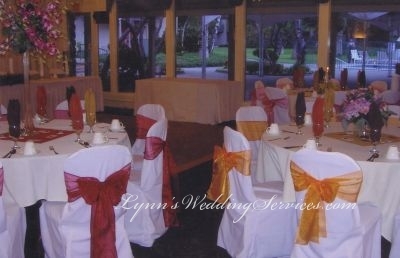 This it is the most economic solution for you to cover up those chairs for your wedding or special event. Carrying many type of wedding chair covers rentals from square back chair cover, larger size banquet chair cover, and high back chair cover as well. 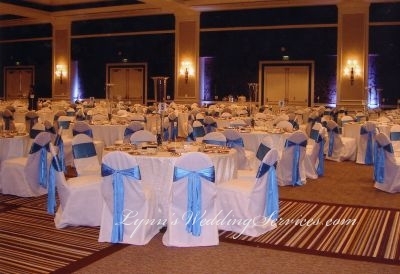 We also provide wholesale wedding chair covers rentals to major hotels and banquet locations. 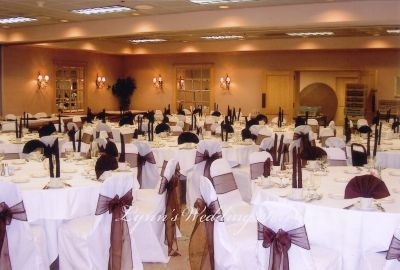 Our goal is to provide quality chair covers, not cheap chair covers but affordable chair covers. We also provide Table Linen rental, Table runner rental, Napkin rental, and Table Skirt rental for weddings, banquets, intimated dinners, birthday parties and formal events in San Jose, San Francisco, San Mateo CA and entired bay areas. We also offer wide range of Chivari Wedding Chairs Rental also. 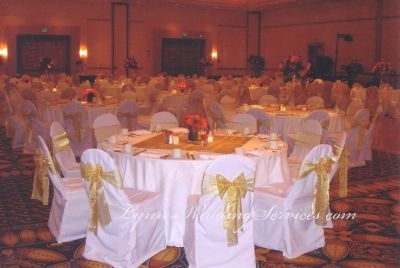 Our Wedding chivari chairs color includes gold, silver, mahogany and black chivari chairs. 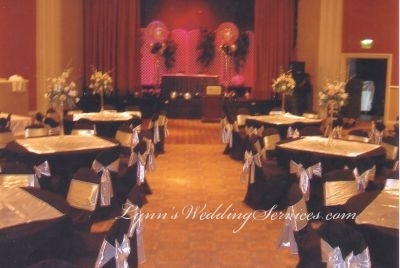 At Lynn Wedding Services, chivari chairs rental offer include delivery, set up and take down the same night. 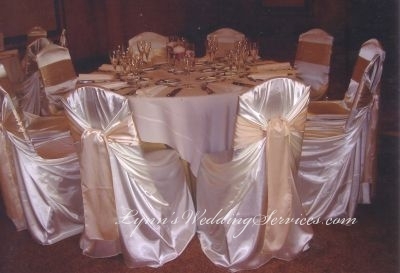 In addition we are always ready to take order for making fancy chivari chair covers for you. We provide full services chair covers rental including set up and taking down on our chair cover rental services in San Jose area, Daily city, South San Francisco, San Francisco, San Mateo, Burlingame, Oakland, Pleasanton, Palo Alto, Half Moon Bay, Carmel, San Francisco, Fremont, Milpitas, San Ramon, Hayward, Morgan Hill, Gilroy, San Martin, and entired Bay Area.